Berlin is a wonderfully diverse and dynamic city, and especially intriguing to visit as a tourist with an interest in history. 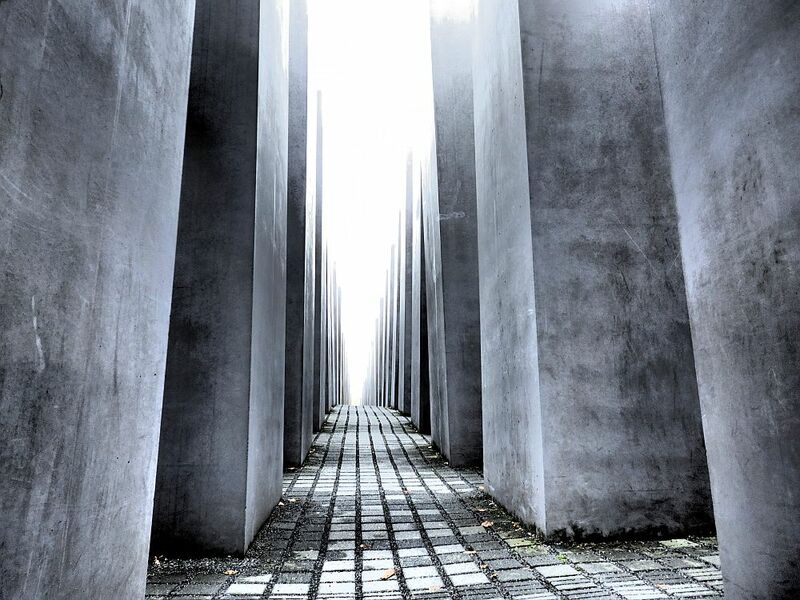 In particular, Berlin is the place to go if you like learning about 20th century history, and, more specifically, World War II and the Cold War. 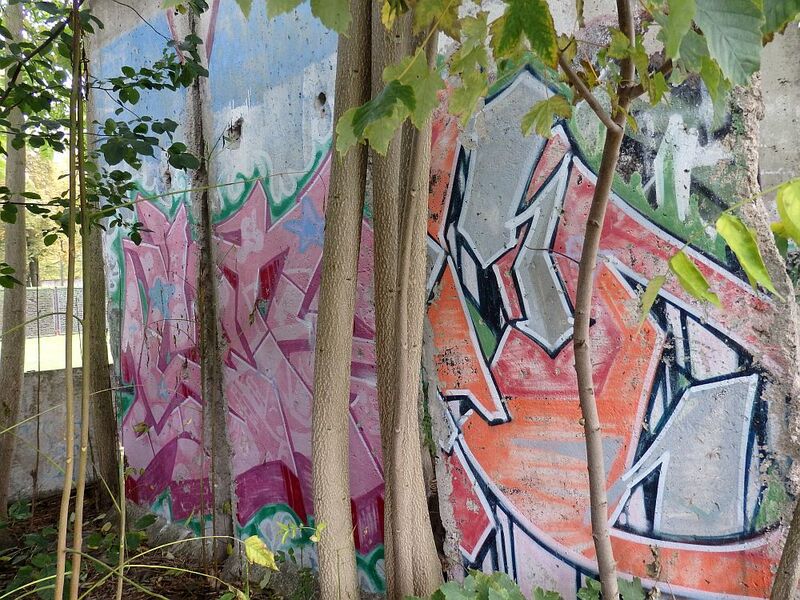 Pieces of the Berlin Wall remain. I’ve written about a number of Berlin’s WWII and Cold War sites separately, and I visited again recently, fitting in a few more. This article, then, is an overview, and for many of the sights you can click through to read more detail. Berlin was and is again the capital of Germany. That means it all began and, ultimately, ended here: all the planning and plotting by the Nazi leadership, and the acquiescence and collaboration of the general population. The phrase that kept running through my mind at so many of these sites was “the banality of evil,” from Hannah Arendt’s report on Adolf Eichmann’s war crimes trial. If you want to read more specifics about the Third Reich and wartime history of Berlin, Wikipedia gives a good overview. In the war, Berlin was heavily bombed, so not much remains of the places used by the Nazi leadership. 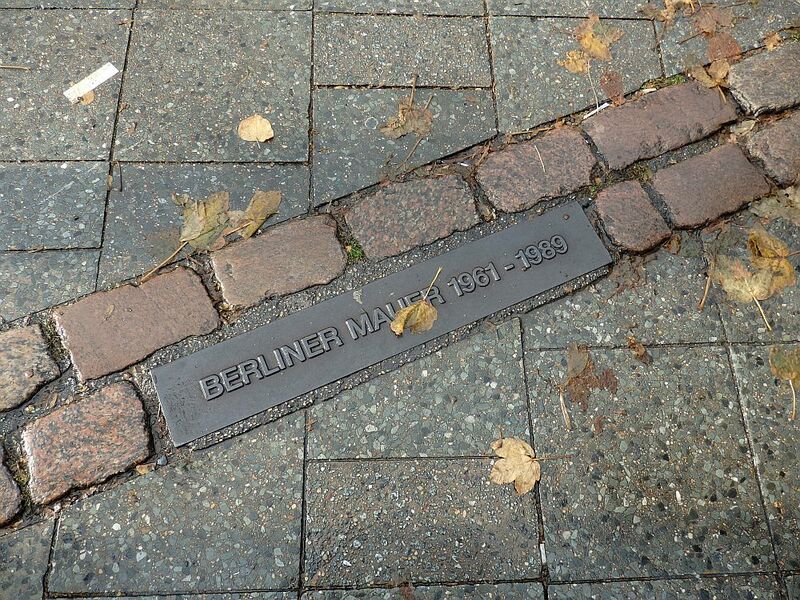 Nevertheless, a number of sights in Berlin that are related to World War II are worth visiting. 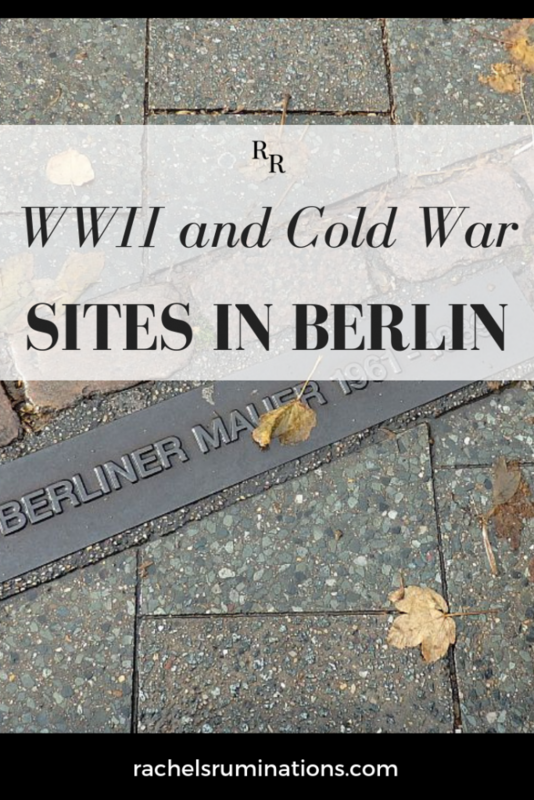 3 Which Berlin World War II and Cold War sites should you see? Berlin Story covers more history than just the war. Starting centuries earlier at the city’s founding, it slows down to focus on Jewish Berlin and the rise of the Third Reich, lingering over the war, the division of Berlin, the Berlin Wall and the Berlin Airlift, the student uprisings, the fall of the Wall and reunification. Berlin Story’s rooms are a bit of a jumble, with an interesting collection of artifacts. An audio tour allows visitors to get more information on various displays. Berlin Story skip-the-line tickets and audio guide. Hitler: How could it happen? I spent much more time, though, in the “Hitler: How could it happen?” exhibit. While it is organized, for the most part, chronologically, it stays consistently focused on the exhibit’s guiding question, circling back to possible explanations for Hitler’s rise to power. Starting even before Hitler was born, this approach emphasizes the coming together of a range of causes that led to Hitler’s rise. Visitors, either viewing pictures and their explanatory texts, or listening to an audio guide while viewing the pictures, walk step-by-step through the details of Hitler’s childhood, his war experiences and his rise to power, with detours into other events that contributed. While this may sound like the designer of the exhibit is an apologist for the rise of Nazism, I did not feel that way. I thought it was an effective way to help me try to comprehend, in particular, why so many ordinary Germans didn’t just remain passive, but actually supported this man and his whole regime. It’s a lesson many societies need to learn, if we’re going to prevent similar atrocities from happening again. This remarkable museum has two parts. Downstairs, in the three “Axes” – long, sloping corridors – visitors are confronted with a very small selection of personal objects left behind by Jews who fled Germany or who died in the Holocaust. The building itself contributes in its design to giving visitors a sense of vulnerability. 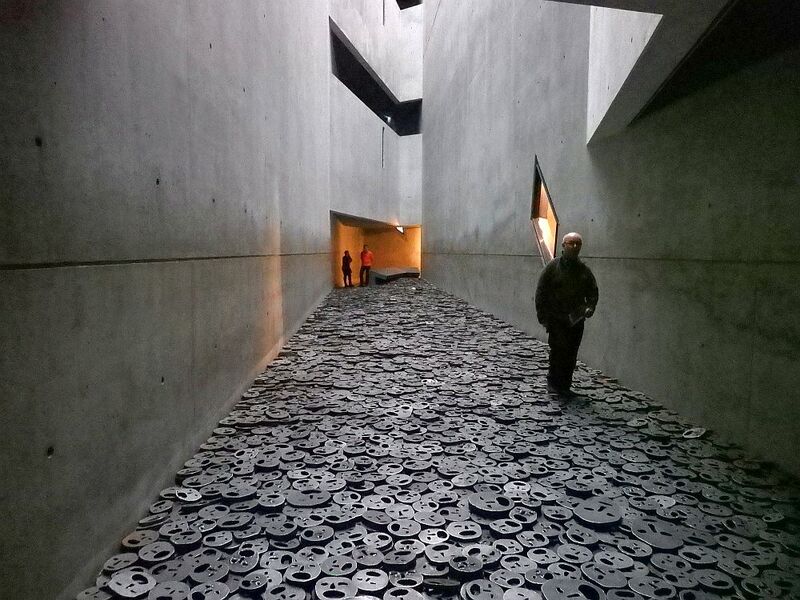 Inside this “memory void” inside the Jewish Museum is an artwork called “Fallen Leaves,” by Israeli artist Menashe Kadishman. Walking on the metal faces makes a harsh clanking sound. Next, visitors climb a long staircase to a more traditional museum charting the history of Jews in Germany, partly chronologically, and partly by topic. This design – creating an emotional connection first, then exploring the Jews’ history – is unusual and, in my view, very successful. You can read more about the Jewish Museum at this link. As early as 1933, a concentration camp run by the SA, Hitler’s earliest paramilitary group, was operated here in a former barracks. Still in their original condition, the rooms they used as cells can be viewed. Photos and documents, as well as an audio tour, explain what happened there. Gedenkort SA-Gefängnis Papestraße : Werner-Voß-Damm 54a, S-Bahn exit General-Pape-Straße. Open Tuesday-Thursday and Saturday 14:00-18:00. Admission: free. The Topography of Terror stands on the site where the Nazi SS headquarters once stood. Now reduced to a few ruined basement walls, the headquarters has been replaced by a stark, modern building where the focus lies on the SS and its history. This is not an interactive museum; it consists mostly of large hanging boards dividing the history of the SS into five spaces. In chronological detail, it explains the rise of Hitler and the SS and the development of their role. It takes their story through the pre-war period, the persecution of the Jews, the development of the Final Solution, and their treatment of the citizens of the countries they invaded. It details what happened to the decision-makers after the war and the various trials and executions. It’s a grim story, told almost blandly. Around the building is a park of sorts. It was raining, so I didn’t hang around, but it looks like it may be the more literal topography of the title. The remains of some SS structures as well as buildings that predated the SS are still visible in places. Walking by the site later, I noticed that the tree-covered land looks bumpy: I suspect this is the result of wartime bombing raids. Topographie des Terrors: Niederkirchnerstraße 8, a short walk from the S- or U-bahn at Potsdamer Platz or the S-bahn at Anhalter Bahnhof. Open daily 10-20:00. Outdoor areas close when it gets dark. Admission: free. 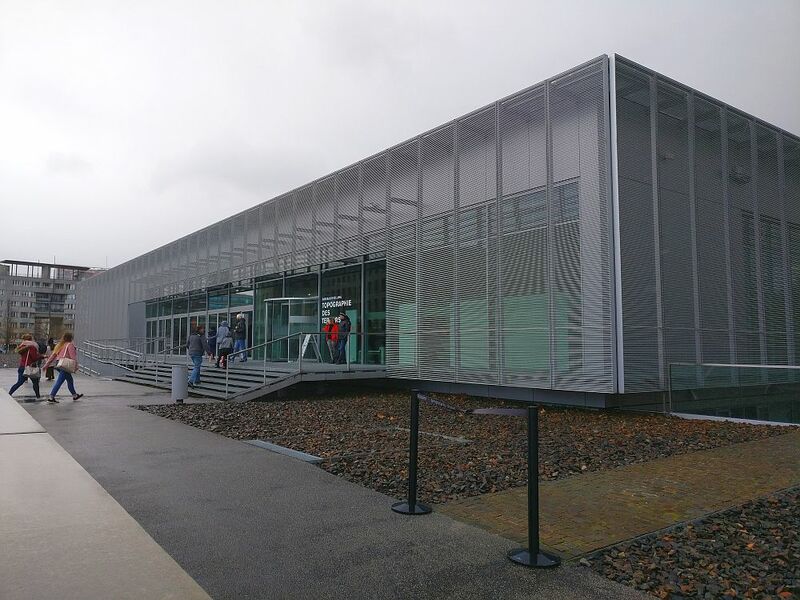 Run by the Topography of Terror and housed in a preserved forced labor camp, this small museum documents and memorializes those who were forced to work for the Nazi regime during World War II. Dokumentationszentrum NS-Zwangsarbeit, Britzer Straße 5. Open Tuesday-Sunday 10-18:00. Admission: free. This is another I haven’t visited yet, but I have been in the alley where the entrance is when I took a street art walking tour of Berlin. 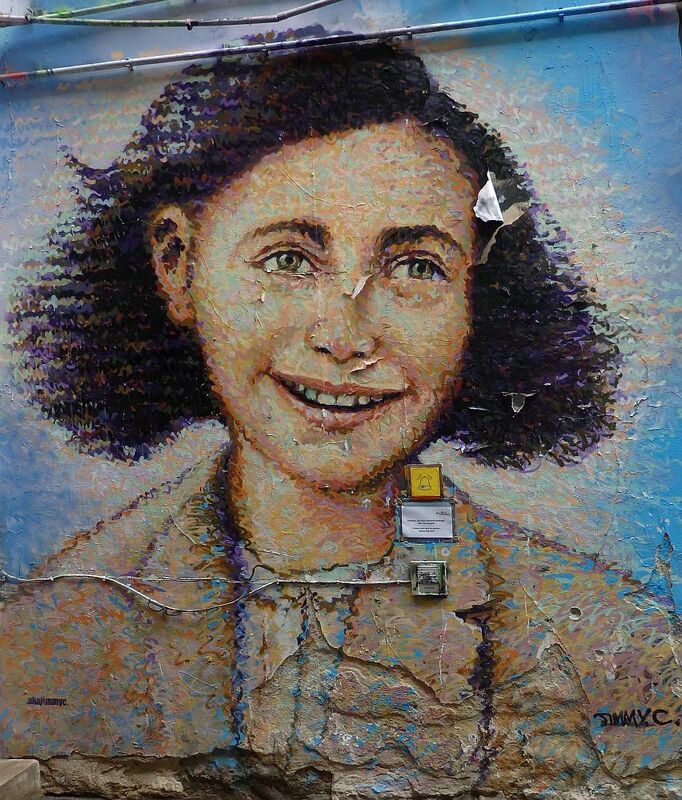 At the time, I took a photo of the large wall painting of Anne Frank, just thinking it was street art. The large portrait of Anne Frank next to the entrance to the Anne Frank Center. The center is divided in three parts: one is about Anne Frank’s life, one is about the youth of Berlin today, and the third is about the diary and why it touches people. Anne Frank Zentrum: RosenthalerStraße 39, walking distance from U-bahn station Weinmeisterstraße or S-bahn station Hackescher Markt. Open Tuesday-Sunday 10-18:00. Admission: €6. This museum marks the spot where the Germans signed the surrender that ended the war in Europe. Its focus is on the eastern front, seen from the German and the Soviet point of view. Deutsch-Russisches Museum: Zwieseler Straße 4, a 20-minute walk from either S-bahn station Karlshorst or U-bahn station Tierpark, or you can take Bus 296 from either station, getting off at Museum Kalshorst stop. Open Tuesday-Sunday 10-18:00. Admission: free. This monument, the size of a whole city block, is evocative of a graveyard. It could be an effective monument in its stark darkness. When I visited, though, it wasn’t. People were climbing on it, taking selfies, running around, laughing. Whether this happens often, I don’t know. Nearby are two more monuments, which also have effective designs: one dedicated to homosexuals killed by the Nazis, and another to the Sinti and Roma who were exterminated as well. You can read about these memorials here. The focus at this little memorial is on resistance. Its location is where an attempted coup failed, but inside, it documents a number of individuals or groups that resisted the Nazis. A permanent exhibit called “silent heroes” memorializes those who resisted the deportation of the Jews in ways big and small. Die Gedenkstätte Deutscher Wilderstand, Stauffenbergstraße 13-14, a 10-minute walk from the Kurfürstenstraße or Postdamer Platz stations. Open Mondays to Wednesdays and Fridays 9-18:00, Thursdays 9-20:00 and Saturdays and Sundays 10-18:00. Admission: free. A number of other sights related to World War II would be less time-consuming to visit. 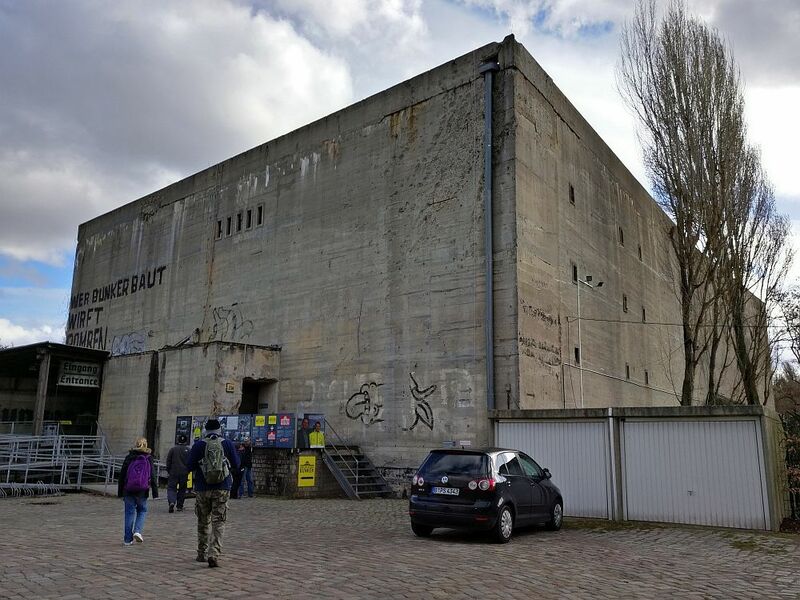 Hitler’s Bunker: The bunker where Hitler spent his last days and ultimately committed suicide was destroyed bit by bit in the 1940s and 1950s. However, you can visit where it was, now topped by a parking lot with just a sign to mark the spot. Führerbunker: In den Ministergärten. Soviet Memorials: There are three Russian war memorials in Berlin, all of which commemorate Soviet troops who died in the Battle of Berlin. One is in the Tiergarten. Another quite grand one is in in Treptower Park, and another, the Soviet Memorial in Schönholzer Heide, is in Pankow. Since many Second World War sites in Berlin were bombed during the war or destroyed afterwards, there are far more Cold War sights to see in Berlin. Here is Wikipedia’s overview of the Cold War in Berlin. 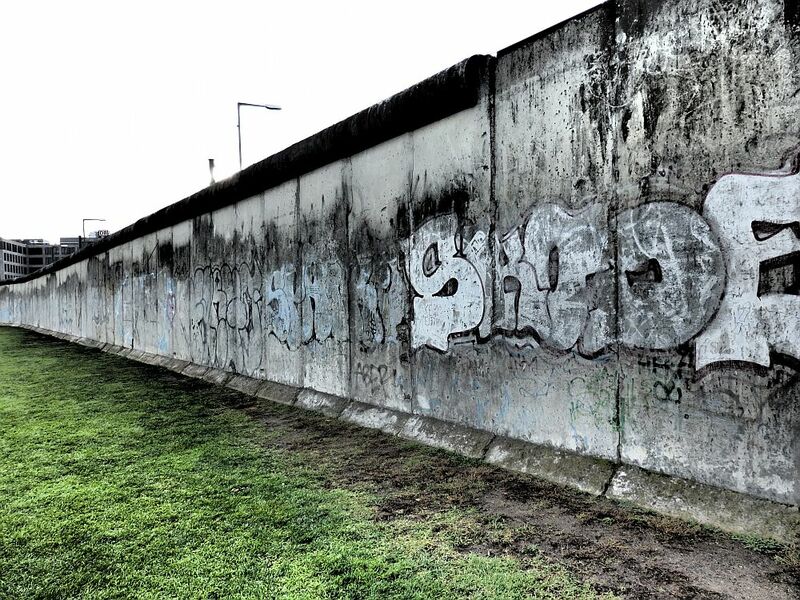 The Berlin Wall Memorial, part park and part restored wall, is the best place to get an idea of just how daunting the Berlin Wall was, and how brave people still tried to escape the oppression of East Germany. In the park section of this open-air memorial, visitors can view large photos or stop at multimedia stations that tell the story of the wall. In another section, the wall has been restored to show how wide it was: really two walls with a no-man’s-land between. 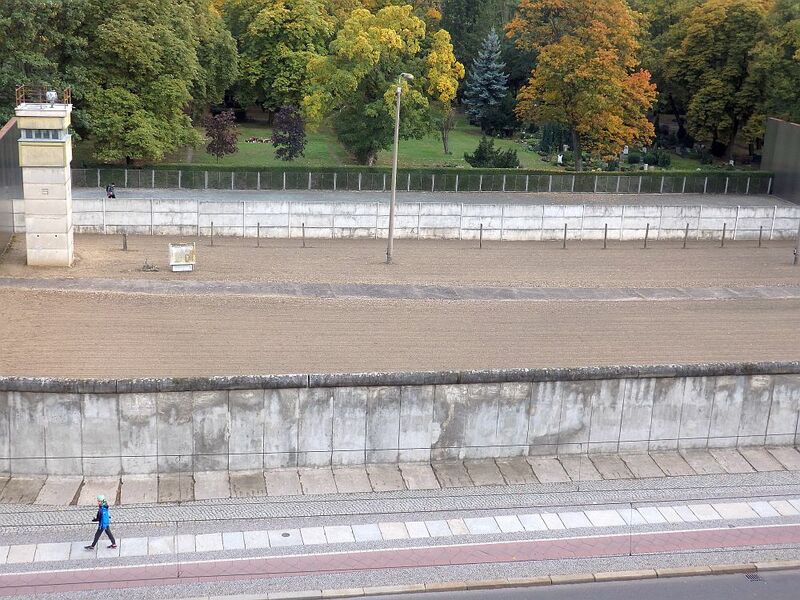 At the Berlin Wall Museum, a short stretch of the Wall has been restored to show how it used to actually be two walls, with a no-man’s land between. The guards in the tower would shoot at anyone trying to cross. Read my article about the Berlin Wall Memorial here. Checkpoint Charlie is certainly the most well-known Cold War site in Berlin. After World War II, when Berlin was divided by the allies into four sectors, this point was one of the “border” checkpoints and stayed the most well-known throughout the period when Berlin was divided. Posing for pictures at Checkpoint Charlie. The museum is the building at the far left. 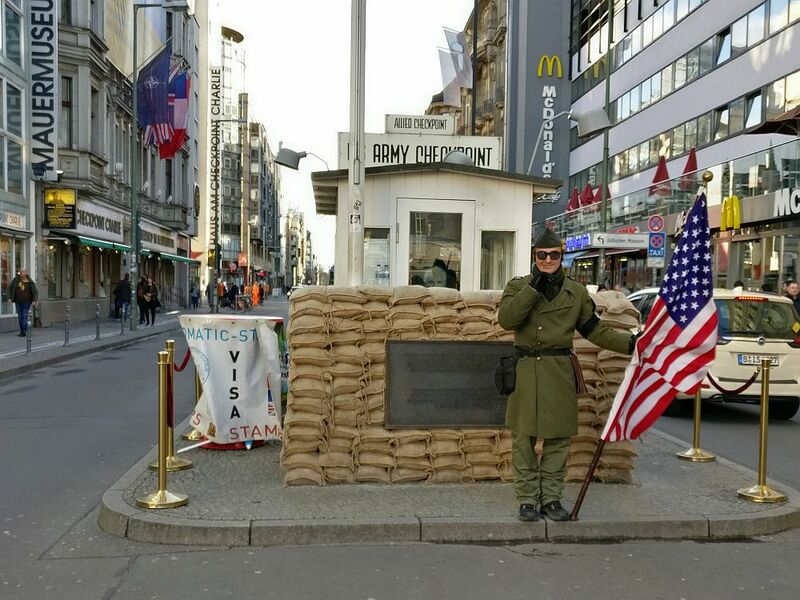 Today, Checkpoint Charlie sits in the middle of a road and actors dressed as US soldiers pose for pictures for and with the tourists who visit. Next door is a museum: The Wall Museum. I haven’t been inside yet, so I can’t attest to what’s in there or whether it’s worth it. What I can say is that the museum’s multiple souvenir shops do a roaring business; you can even buy an original piece of the Berlin Wall. Checkpoint Charlie: Friedrichstraße 43-45, a short walk from U-bahn station Stadtmitte and from U-bahn station Kochstraße/Checkpoint Charlie. The booth itself is visible all the time. The Wall Museum (Mauermuseum) next door is open daily from 9-22:00. Admission €14.50. Skip-the-line tickets to the Checkpoint Charlie Wall Museum. The focus of this excellent museum is what it was like to live in East Germany during the Cold War. 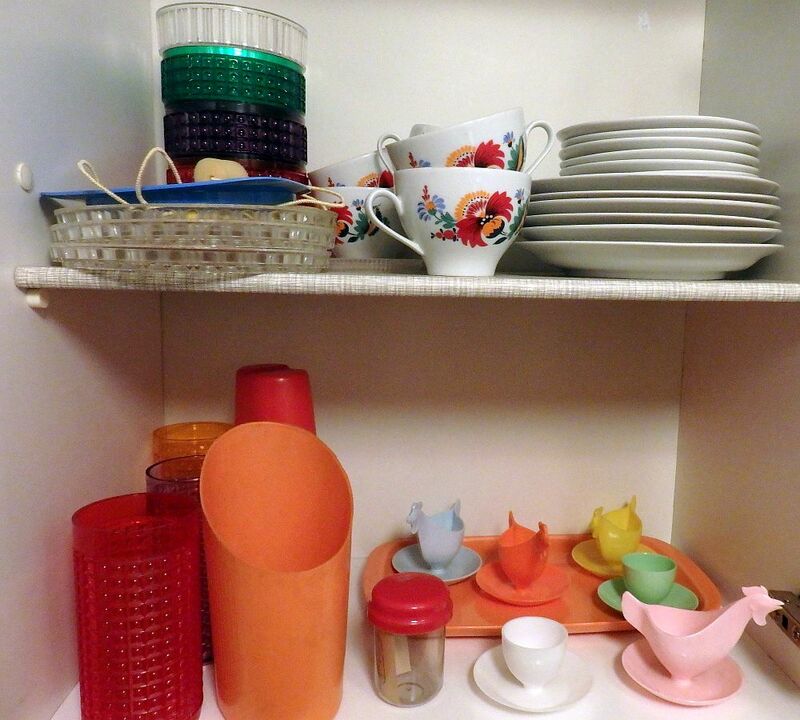 With its collection of East German consumer goods, its interactive exhibits and its recreated rooms from an East German apartment block, it makes the limitations and restrictions of life in East Germany palpable. Click here to read my article about the DDR Museum. Skip-the-line tickets to the DDR Museum. 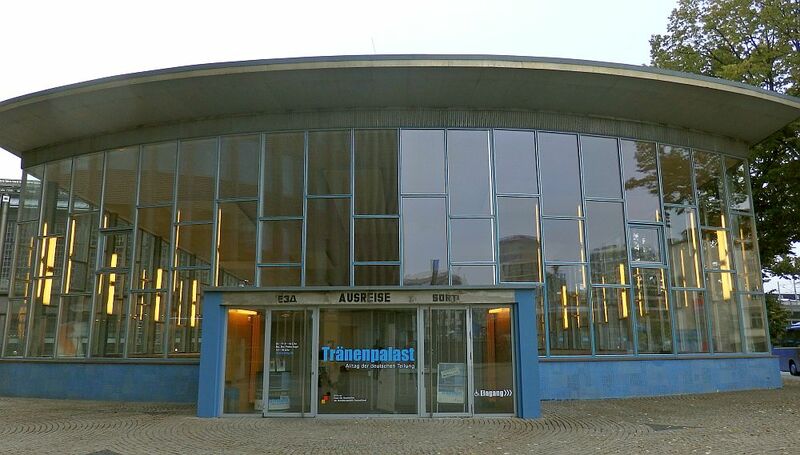 This restored train station hall is called the Palace of Tears because it was where the lucky few who were allowed to cross to West Berlin said good-bye to their families. Even if they weren’t going far, they might never see their families again. Converted to a simple museum, it illustrates the issues around the strict control that the East German government kept over citizens’ lives. Click here to read my article about the Palace of Tears. This is another that I haven’t seen yet. A friend visited it with her pre-teen daughter and said that it was a good one to visit with a child because of its interactive exhibits. Deutsches Spionagemuseum: Leipziger Platz 9, near the Postdamer Platz S- and U-bahn station. Open daily 10-20:00. Admission: €12. Tickets to the Spy Museum. All of the Cold War sites in Berlin are related in some way to the Stasi, the East German security apparatus. 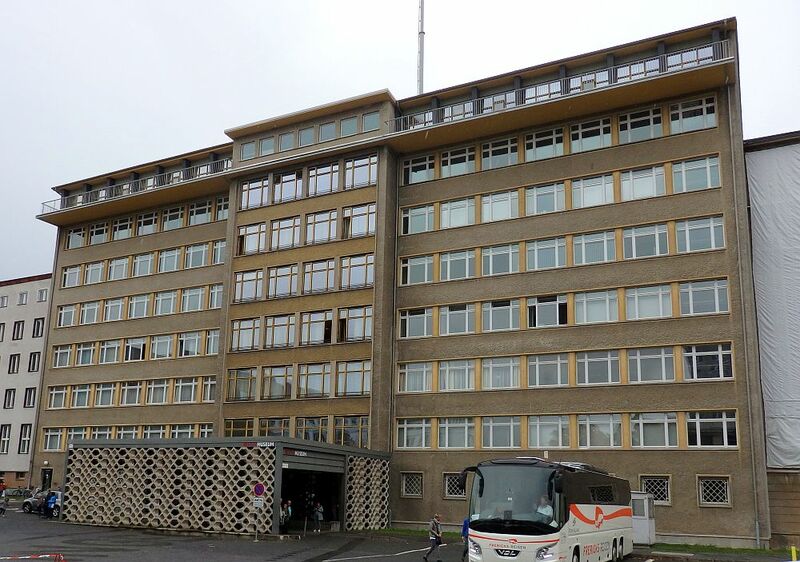 This seemingly ordinary office building is where the Stasi based its operations: keeping close tabs, at any cost, on the East German population. Here you can wander the mundane 60s-era offices where they directed the spy services bureaucracy and see exhibits on collaborators, interrogation techniques, spy technology and so on. I wrote an article about the Stasi Museum, which you can read here. The Stasi bureacracy occupied a series of very ordinary office buildings, including this one, which now houses the Stasi Museum. This prison is now a memorial to the people who suffered in it under the Soviets and later the Stasi. Used as an internment camp by the Soviets when they occupied East Berlin, this was where the Soviets punished thousands of inmates accused of being Nazi collaborators, as well as “hostile elements,” i.e. spies and subversives. Later, in 1951, the Stasi took it over and used it to lock up and often torture those seen as enemies of the state. Gedenkstätte Berlin-Hohenschönhausen. Address: Genslerstraße 66, near the Alexanderplatz stop on the U- or S-bahn or the Landsberger Allee stop on the S-bahn, or take tram M6 to the Genslerstraße stop. Open daily 9-18:00. Tours in English daily at 14:30 and from March to October also at 11:30. Admission: free. The Allied Museum focuses on the history of the Allies in Berlin from 1945 until Allied troops left in 1994. Its exhibits include some large items like a plane used in the Berlin Airlift. The exhibits catalogue the airlift and Berlin’s status as a city surrounded by East Germany as well as the role of the Allies in Berlin during the Cold War. AlliiertenMuseum: Clayallee 135, near the U-bahn station Oskar-Helene-Heim. Open Tuesday-Sunday 10-18:00. Admission: free. Tempelhof is the airport that the Allies used to carry out the Berlin Airlift. The massive terminal building, built by the Nazis, is being repurposed in various ways, but in the meantime you can take a two-hour tour of Tempelhof. Or take a tour of the bunkers under Tempelhof. Berlin Wall fragments: You’ll happen upon pieces of the Berlin Wall here and there all over the city. One long segment (more than a kilometer long!) called East Side Gallery is fully graffitied. (Muhlenstraße , near S-bahn station Berlin Ostbahnhof. Open all the time, free). A more damaged section of the Berlin Wall – damaged when the wall “fell” and people chipped bits off of it – lines one edge of the Topology of Terror’s site. Another stands as part of the Berlin Wall Memorial. Another thing to notice is a double line of bricks that snakes across the city and marks the original path of the Wall. Nowadays, it’s just part of the pavement, so it’s easy to miss. Which Berlin World War II and Cold War sites should you see? If you only have a day or two, see the best of these sites. For World War II sites in Berlin, I’d recommend the Jewish Museum as a must-see and, perhaps, the Berlin Story Bunker for a general overview. For Cold War sites, definitely see the DDR Museum, the Berlin Wall Museum, and the lesser-known Palace of Tears. If you want to cover a lot in a little time, consider taking one of the many themed tours offered through GetYourGuides. 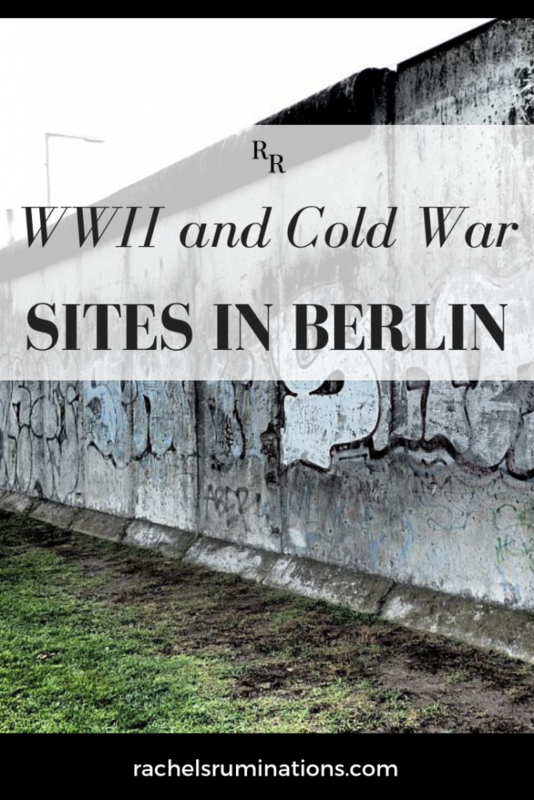 Have you visited WWII or Cold War sites in Berlin? Which would you recommend? Have I left any out? Please comment below! 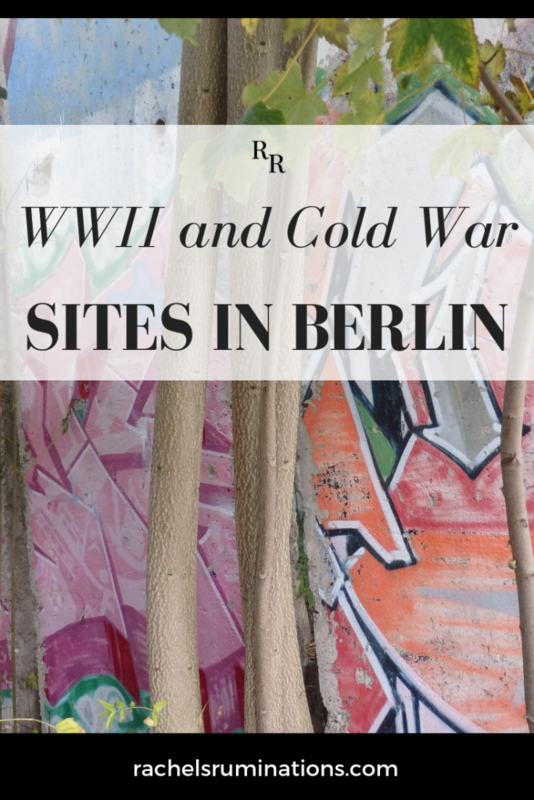 An excellent round-up of WWII and Cold War sites in Berlin. Pinned. Berlin is such a fascinating city, I would love to visit one day. So many pieces of dark history. I would make sure to get to the Jewish Museum. The Fallen Leaves piece seems especially heart breaking.